How many things have dentists recommended to you in your life that didn’t involve brushing or flossing? Not many, right? 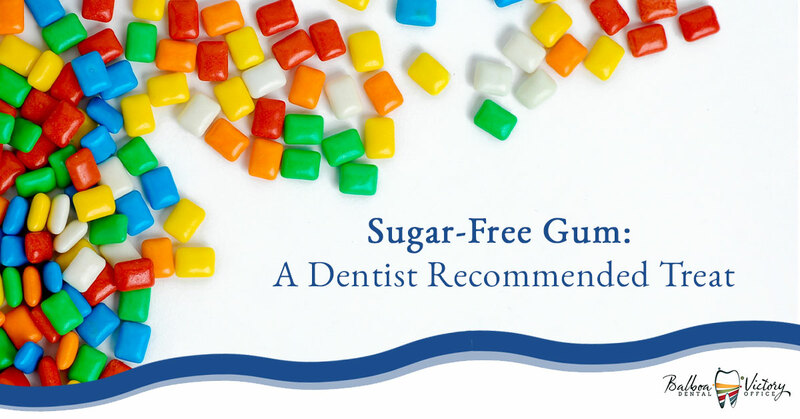 Well, what if we were to tell you that sugar-free gum is recommended by most dentists – and not just as an alternative to sugared gums. You heard it right; sugar-free gum isn’t just acceptable from a dental perspective, but actually recommended. This means you can enjoy chewing on gum to freshen your breath, keep you entertained in a meeting, or decorate the underside of your bus seat (admittedly, this is not recommended by dentists – or anyone). Wonder why sugar-free gum is good for you or why we make sure to make the sugar-free distinction so clear? Read on! There are some strengths to chewing gum for teeth in a general sense, but the difference between sugar-free and sugared gums is actually exponentially greater than simply “sugar or not.” For those who maybe aren’t aware, all sweeteners aren’t created equally when it comes to tooth damage and oral health risk; in fact, sugar ranks pretty highly on the list of the worst things your teeth can be subjected to. Xylitol, a popular natural sweetener found in sugar-free gum and other food products, on the other hand, is actually quite good for your teeth in a number of interesting ways. Compared to sugar, which is known to cause decay and cavities, xylitol looks even more appealing from a dentist’s perspective. As we promised, though, we’ll also explain how sugar-free gum goes beyond simply being a suitable replacement for sugared gum chewers, and actually earns a full-on stamp of approval and recommendation from dentists – even for those that currently chew no gum whatsoever. This can be best understood by looking at saliva production in your mouth, how xylitol impacts this production, as well as the importance of saliva in general. Without saliva, your mouth would suffer from more than just an uncomfortable tongue; saliva is crucial to preventing tooth decay in a number of important ways. Above all, saliva is our body’s natural way of “brushing,” as the slightly acidic properties found in saliva help to eliminate damaging bacterias before they create rot on our teeth and gums. Additionally, saliva also helps to keep damaging food particles from settling on our teeth whatsoever, sweeping them down the throat to be dealt with by the much more aggressive digestive systems found in the stomach and intestinal tract. Finally, saliva restores minerals, such as calcium, to our teeth as the day progresses. After we eat, there is usually some degree of mineral damage that requires restoration from our saliva, which can take up to an hour or more. In between meals, your saliva works hard to restore your teeth to their full strength in anticipation of the next meal. In fact, the reason it is so important to brush first thing in the morning and last thing at night is largely because of saliva; production of saliva drops to almost nothing while we sleep, saving water and preventing the need for swallowing. By brushing at these times, we bolster our teeth while they are at their most vulnerable, allowing saliva to take care of us through the day! So, you’re probably wondering how sugar-free gum relates to saliva. The relation is actually surprisingly simple: Xylitol promotes saliva generation, which naturally protects your teeth. So, how does one take the most possible advantage of this benefit, as requested by a dentist? Chew sugar-free gum shortly after eating to receive the absolute highest level of benefit. This is when your teeth are the most exposed to food particles, lacking in minerals, and your saliva production experiences a natural lull. This triple threat makes sugar-free gum exponentially beneficial after a meal because xylitol directly increases saliva production, which then allows it to get to work on removing excess food particles and restoring the minerals lost through chewing much, much sooner. In fact, it is estimated that simply chewing sugar-free gum gets your teeth back to their full strength three times faster than doing nothing. Who is Sugar-Free Gum Recommended For? In all seriousness, though: Sugar-free gum is almost always beneficial to those that chew it. As surprising as it seems, the crucial importance of saliva and its relation to xylitol makes sugar-free gum an easy recommendation for most dental patients. Contrary to what we often hear from patients, it is almost always perfectly safe for patients with diabetes or dentures to chew sugar-free gum; in fact, they often benefit just as much or more from the practice! While it is no replacement for brushing twice daily, it can certainly help to naturally protect your teeth and gums between those times. Get in touch with the friendly staff at Balboa Victory Dental with any questions you may have about our dental care, practices, and even general information, like the our thoughts on sugar-free gum – we love to answer those questions! At the end of the day, our entire staff just wants to assist your family find the dental care that is best for you, so we’re truly happy to help in any way. Our office is proud to accept many of the major insurance companies, as well as many local providers that are specific to Encino and Lake Balboa patients, plus we often see Denti-Cal patients, as well. Get in touch with our staff today to see what our dentists can do for your family’s oral healthcare. Learn more about our dentistry and patient services, then schedule with us today!